for a 10 year period and includes student centered college coordinated instruction for grades 4 through 12. Additional IMPROVE immersions can also be implemented for the college setting. 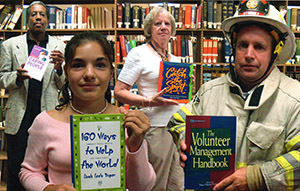 As a developmental education program, each level builds on learning from the previous level. 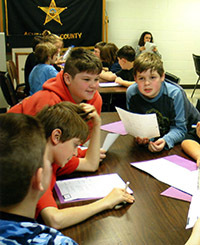 The IMPROVE immersion model includes nine essential elements including:1) student centered college coordinated instruction; 2)instructional media integration; 3) dramatized, contrived and/or direct purposeful experiences; 4)civic engagement tours;5) community-based learning forums; 6) interactive breakout sessions; 7) service learning activities and reflection & empowerment; 8) multiple inteligence programming; 9) and empowerment through reflection. Inspired by the NSEE Experiential Education Community-Based Organization of the Year Award, Inspirational Media International has designed this web site to show interested school systems and governmental agencies across the country how IMPROVE can be implemented within their communities. In 2000, the Ashtabula County Sheriff's Department ( Ohio, USA ) began collecting criminal and unwanted weapons throughout the state following the gun fatality of a six year old boy. Within a year, thousands of weapons were collected and melted into a monument. 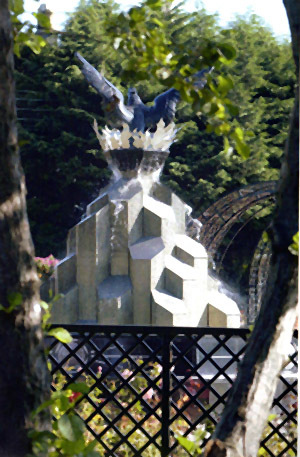 The symbolic monument was later dedicated to the divided communities of Northern Ireland in support of their ongoing peace process and became as the Phoenix Peace Fountain. As NI Councillor John Dallat stated " the Phoenix Peace fountain is a constant reminder of the need for the communities of Northern Ireland to work together so that a lasting peace can be achieved". The fountain is now located in Coleraine, Northern Ireland. USA/NI peace monument project into a global peace mission was born. As stated by a search and rescue worker Michael Whitely, "There has never been more of a need to keep this type of initiative alive. Our law enforcement agencies and community leaders globally must find new ways of working together to reduce violence and terrorism in the name of peace". Consequently, police and community leaders in both Northern Ireland and United States established Mission IMPROVE. As the first undertaking of Mission IMPROVE, leaders from the NI government recommended that their Police Service (PSNI) melt down firearms for the creation of a Phoenix Peace monument to be placed in the USA. As states by NI Councillor David Mc Clarty, " IMPROVE is more than a mission to build a monument, it is a mission that speaks to police and community leaders throughout the world of the need to work together to stop terrorism and violence globally". This support from Northern Ireland governmental leaders led to an eventual unprecedented weapons meltdown by the PSNI on March 3, 2003 resulting in tons of metal ingots being sent to the USA.The Garda police in the Republic of Ireland next became involved with the movement in January 2004,destroying over 800 weapons that have been that have been used in criminal and terrorist acts. Furthermore, the police services in England, Scotland and Wales coordinated the destruction of weapons in August 2004, followed by Slovenia in November 2004. Since that time, representatives of Mission IMPROVE have met with Interpol President Jackie Selebi in Lyon, France. Through his support, the South African Police and the Mozambique Police Service are preparing for the next IMPROVE gun meltdown. In addition, the 182 member countries of Interpol are being invited to do the same in anticipation of other symbolic monuments being placed around the world.